Hey everyone! 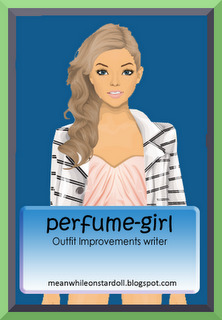 It's perfume-girl with a new outfit improvement! This one was not requested, and I think nobody requested one, so please apply for an outfit improvement! If you DID request one and I didn't do it yet, please do it again in the comments bellow! :D Thanks! This was her original outfit, and I didn't like it that much.. So I took away these.. I created another rock chic outfit, and as you can see I only kept the shoes. Her closet is really interesting and it was hard to create a pretty outfit, but I tried my best. There are many expencive pieces in this outfit. If you want me to improve YOUR outfit, you can sign up in the comments and I will choose someone for my next Outfit Improvement! If no-one signs up, I will choose someone myself, and the doll will stay anonymous.